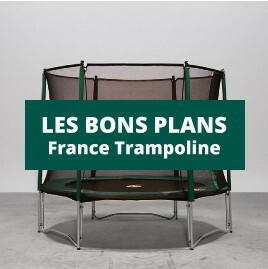 France Trampoline has a wide range of accessories to ensure you comfort and the safety of your trampoline. These accessories are adapted to all our ranges of trampolines and make using them safer. The cleanliness cover protects your trampolines from the weather, the roof means that you can use the trampoline even in very warm weather and the skirt covers the bottom of the trampoline to prevent children from hiding underneath. The storage pocket is a small practical component. Protect your trampoline! These accessories ensure the safety of all users and make the whole experience more comfortable. Our accessories are certified by their quality and durability. Warning, the roof is not available for the rectangular trampolines. Trampoline tarpaulins There are 30 products.